Although my parents divorced when I was a freshman in high school, my brother and I are incredibly fortunate in the fact that they’ve always been amicable. Sure they had their moments, but overall they handled themselves with a great deal of grace. My parents are pretty much two of the most amazing people on the planet and the way they handled their divorce certainly shaped who I am as a person today. Having gone through break ups myself and having helped friends get through theirs, I’ve never been able to wrap my head around the animosity and often times hatred that tends to develop when two people decide to part ways. The very first time I ever had Tiramisu was at a birthday celebration my parents arranged for me after their divorce. Everyone – including my dad’s girlfriend (now stepmom) – sat down to a meal at Buca di Beppo. We passed family style plates of spaghetti and salad and finished our meal with a huge bowl of Tiramisu. It was literally love at first bite. 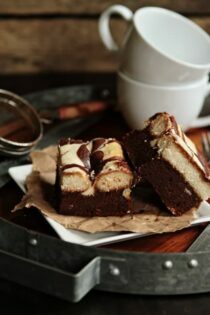 Tiramisu brownies are a fun and modern twist on a classic dessert. They still have all the familiar flavors – mascarpone cheese, dark chocolate, lady fingers and rich, Italian Roast coffee, but they’re in bar form, so they’re totally portable and perfect for parties and potlucks. I made these brownies with Barista Prima Coffeehouse’s Italian Roast blend. If you’re into deep, dark, espresso-like coffees, Barista Prima is for you. I’ll admit that they’re a little strong for me as a daily drinking coffee, but I can’t deny that they are perfection when paired with chocolate in desserts. I was pretty happy to relive my Tiramisu love with this month’s Keurig K-Cup Ambassador shipment, and I think you’ll love this recipe as much as I do. 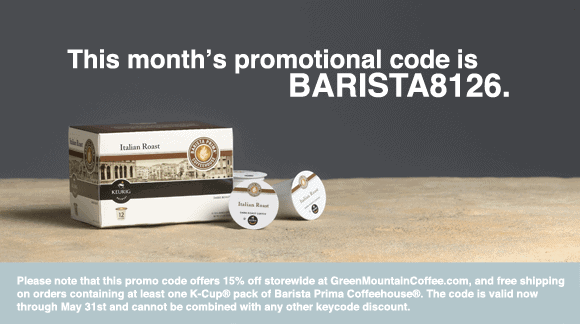 And, because Green Mountain Coffee wants to make sure you can make this recipe at home, this month’s coupon code gives you 15% off storewide at GreenMountainCoffee.com, and free shipping on orders containing at least one K-Cup® pack of Barista Prima Coffeehouse®. The code is valid now through May 31st. So tell me, how do you feel about Tiramisu? Do you have a deep, abiding love for it like I do? 1. In a large bowl, melt the chocolate. Stir until smooth and leave it to cool. Heat the oven to 350°F. Line a 13″ x 9″ baking pan with parchment paper. Add chocolate to a mixing bowl with the paddle attachment on. Beat in the butter followed by 1 cup of sugar and the 4 eggs and 4 egg whites. Add the flour and mix on low speed until just combined. Pour the batter into the prepared baking pan minus 1 cup of the brownie batter. Lay the ladyfingers upside down on top of the batter, and push down slightly. Brew 1 Barista Prima Coffeehouse Italian Roast K-Cup pack. Using a pastry brush, carefully brush the Barista Prima Coffeehouse coffee over the ladyfingers until they are saturated. 2. In another bowl, combine the mascarpone cheese, cream cheese, and 1/4 cup of sugar, 4 egg whites and vanilla extract. Spread topping over ladyfingers over ladyfingers. Place spoonful of brownie batter on top of the creamy filling and swirl it lightly with a toothpick or knife. 3. Bake for 45 to 50 minutes or until center is almost set and brownies begin to pull away from sides of pan. Cool completely in the pan before slicing it. 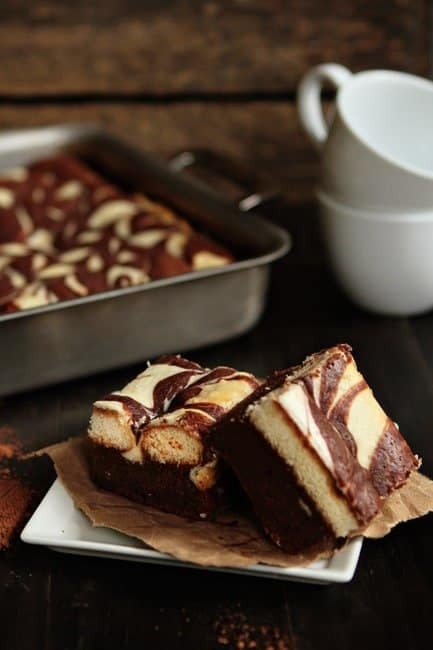 Pingback: Tiramisu Brownies » Eat. Drink. Love. has anyone actually tried the recipe and have a comment to share? Could you please write also the amounts in grams? Follow this link to an easy converter. http://calculator-converter.com/converter_g_to_c_grams_to_cups_calculator.php I hope this helps. Just found this recipe and it looks awesome. I am going to make a few batches for a party, but the party is not til next month. Will these freeze ok? Hi, Shelley! They should be able to freeze for about 3 months. I hope you enjoy them! Would these be ok to freeze? Hi, Shelley! They’re probably fine to freeze, but I wouldn’t cut them and freeze them. Freeze them whole and then thaw when you’re ready. Cut into individual servings then. I hope they work out for you! Would these come out ok if I bake them in individual muffin tins? Hi, Mehana! I would give it a try. Reduce the baking temperature (maybe by 25 degrees) and shorten the baking time. Keep an eye on them so they don’t over bake. I hope you enjoy them! What a great recipe!! Absolutely trying this later. Now.. what am i gonna do with 8 yolks? I hope you like it, Ata! Here’s a great article with several ideas for using up egg yolks. Good luck! Could I use egg whites from a carton so I don’t have to buy so many extra eggs this week? I haven’t used egg whites from a carton, so I am not sure how they will perform in this recipe. Thanks for stopping by. Thanks for this delightful recipe! I just made these and they are baking now! I subbed my go to keto espresso brownies and subbed keto ladyfingers and used swerve instead of sugar in the mascarpone layer! This way we can eat them and not compromise our way of eating. I plan to take them to my son’s house for Christmas! Thanks so much for stopping by, Linda! I appreciate you taking the time to comment. Happy Baking!